Welcome sweet friends to this week's #TuesdayTune post. This is a rather solemn weekend for many as it is the nine year anniversary of the 9/11 attacks. It is also the weekend when my husband and I will be remembering the twin boys that we lost 15 years ago. My sweet little boys were born too early and now they are in heaven; they are guardian angels looking over us and protecting us each and every day. Today's Song is dedicated to all people who are remembering lost loved ones. It is a song of remembrance, love and faith....a song about Angels. I am linking this post to my weekly Say G'Day Saturday Party. My heart breaks for you and reacheds out to you. What a sad weekend it is for all of us. Bless you. bless you and your family. sorry for your loss. Natasha, thinking of you and this lovely remembrance. The loss of a child leaves a void in ones heart for eternity. I love that song. It made me cry the first time I heard it and still does! I'm sorry about your loss. There's always a place in our heart for those we've lost. I haven't heard this song in a while... I love this song. Natasha, I am so sorry to hear about the loss of your twin boys. This is such a moving song. Big hug for you, I hope you are having a good day with your family today. I am so sorry for your loss.Just know that he has your babies cradled in his arms. Dear Natasha, I must admit I am a bit lost for words, all the words I think of sound a bit of a cliché. But I did want to let you know how sad I was reading about the loss of your two sons! Hi Lindy Lou! I just wanted to say thanks so much for your sweet message. I just popped by and left a message for you saying that even though today is sad for us it is also a happy day because Mr Attorney and I met on this day 18 years ago! So your song choice is absolutely perfect considering the happy ever ending on the film clip! I am sorry for your loss. I do believe we are still connected to those we've lost. And it's so important to remember them. I'm remembering with you today. Dear Natasha, I didn't know you had lost twins. I'm so sad for you! But I'm glad you are spending today remembering them. How amazing that you chose that picture for them at the top! That's the same picture I used (on little cards) to send out to 'announce' the passing of my 6 1/2 month (in the womb) little boy, Samuel. He was born perfect but about the size of your hand. I thought I would never get over it. 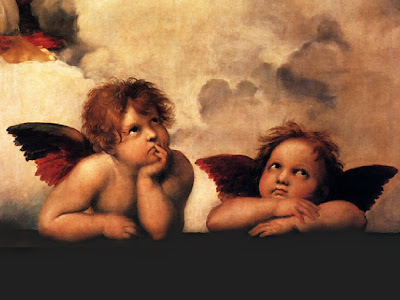 I love those pictures of the cherubs as they seemed to celebrate the short life of my precious little boy who never lived outside the womb. This evening, if I can, I will link to my song "Like Me" about one of my babies. It starts out..
capricious curls,legs short and stout. Like a flower blooming day by day. since a baby's soul one cannot own. I hope you don't mind me sharing some of the words just in case I don't get the song posted. You can read the rest of it or hear it at my music blog www.songsoghome.blogspot.com. I hope it blesses you. It makes me think of your photo of the angels. I'm getting ready to head to Dallas for a final trip to my Dad's house for more estate work. It seems to have taken over my life in some ways! I do hope there is time to come back here this evening. Thanks so much for your sweet comment the other day about my new grandson. Sending you gentle hugs within the wings of your Angels. Beautiful song. I lost my mother and brother this past year and the lyrics are meaningful. Another song that always makes me cry and think of them is Sarah Brightman's "Time to Say Goodbye". Dear Natasha, I understand your pain. To be a mother is to love our kids more than we love ourselves. I am glad now you are blessed with two wonderful kids and they are blessed with a great mom and dad! This has been a difficult weekend for all of us. Your grief is compounded by the loss of your twins. God bless you. This is a beautiful post, thank you. I am thinking of you and your sweet little boys. A loss of a child is so hard to carry. Besides the loss, it is out of the natural timing - the child before the parent. I am glad that you also have good memories of this time of year. G'morn ~ Josh & I sing together all the time, he moves me to tears. Love this song, I love all his songs. Oh, Natasha, I did not know you have had such a huge loss in your life. What a blessed reunion you must look forward to in heaven when you will be together again. Heartfelt and beautiful song and lyrics! Natasha, I'm sorry about your babies. Thanks for remembering 9/11. Was a tough year. Blessings this weekend on you and your family. I love Josh Groban and this may be my favorite song that he sings. I know you are looking forward to the day you will be reunited with your sweet baby boys. I tried to post a comment earlier but I don't think it went through. Josh Groban is one of my favorite singers and this song may be my favorite of all his songs. I know it has given comfort to a lot of hurting people and I know it is helpful to you. Thank you for sharing your heart and this beautiful video. It is only because of the Love we have for God that we make it during the hard times. God bless you and your family.I'm was sadden when I read your story. Natasha, so sorry for your loss those many years ago. What a trying event to endure - God bless you and your husband. I am so sorry you lost your little ones. I'm sure that isn't something you ever fully recover from. Thank you for you comment on my 9/11 post. I think I'm just learning how much an American crisis reached others all over the world. This is one of my favorite songs...made me cry today. I am so sorry for your loss. You have two very special angels watching over you. I did receive your email joining in on the Christmas swap and sent you an email in reply (it may be in your spam) and left you a comment on your Christmas blog. Natasha, thank you for the song. I have a little one in heaven with your boys. Not by chance that I stopped by today. What a beautiful, sweet and moving song by Josh Groban. Thank you for sharing it with us today! It's very befitting and a wonderful tribute to all of our loved ones who have gone on...before us! I rest in Jesus' promise to us...that our loss is just a temporary absence...for we shall meet again...never to part no more! I am so sorry for your loss, sweet friend! I really can't imagine the pain of losing a child! Sending hugs and prayers your way today, Sweetie! I am also remembering and paying tribute to all of those who lost their lives on 911. Praying for their families as well! Thank you for sharing this lovely and heartfelt tribute with all of us today! So glad that you shared it with Sunday Favorites!!! #TuesdayTune - A Few of My Favourite Things! A few of my Favourite Things Give Away! The Beauty of Spring ~ Pink Roses.